1) You’ve been nominated for Best Football Site and Best Football Podcast, chosen by both fans and industry experts, how does it feel? it is, so it’s nice when that effort is recognised. 2) What kind of year has 2010 been for Guardian Football? A really good one. Website traffic – in terms of average monthly uniques – is up 35% year-on-year while Football Weekly averages 120,000 downloads and regularly makes the top 10 of the overall iTunes chart. We’ve also done lots of innovative journalism – off the top of my head, our live blogs for the Liverpool sale in October, the Guardian Fans’ Network for the World Cup, our Twitter interactive for every World Cup game and Jonathan Wilson’s The Question blogs on tactics stand out – while our regular offerings such as the minute-by-minute reports, continental football coverage, Joy of Six etc plus our news and general output have also been strong. Not resting on our laurels – and always trying to work out what the reader wants before everyone else does. 5) Have you seen the Castrol Football Rankings? What do you think about them, and who do you think is the best footballer in the world at the moment? 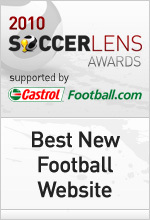 You mean the same Castrol Football Rankings that are sponsoring these awards? Can I plead the Fifth? Actually, they’re not that bad but I have my doubts about how effectively you can boil down the dozens of actions a player might make over the course of year to a single number. But I agree at least with their No1: because Leo Messi is clearly the best player in the world right now.